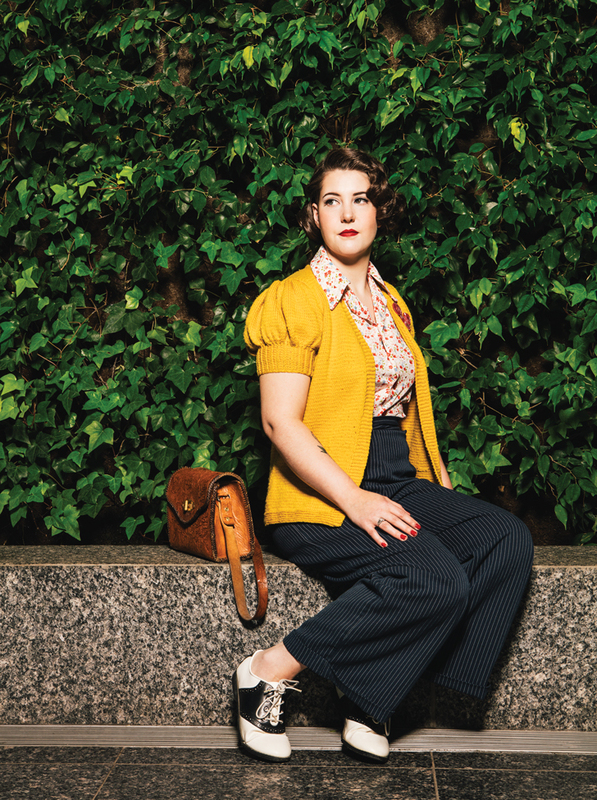 Laurie Callsen melds her fascination with the ’40s with a very modern job. Not everybody watches old movies, listens to music from a decade long past and regularly researches the lifestyle of the 1940s, all in order to get dressed each day. But for Laurie Callsen, “really getting to know the era” is key to her style. 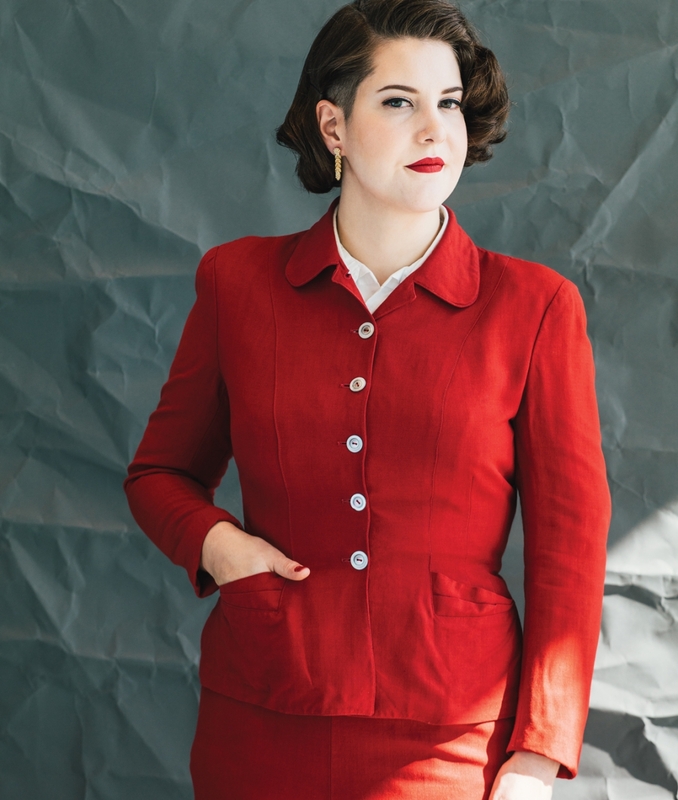 That’s because, five years ago, Callsen’s long-time interest in 1940s history and fashion led her to adopt a distinctively retro look. At the time, Callsen was just starting her career in journalism – she was working as a reporter for the Camrose Canadian newspaper – and taking on a more polished look. Dressing in a professional style once common more than 70 years ago “just felt right,” she says, and made her love getting ready each morning. The 25-year-old has refined her look over the years, as she learned to knit and sew and started her own vintage lifestyle blog, Retro-Reporter.com. 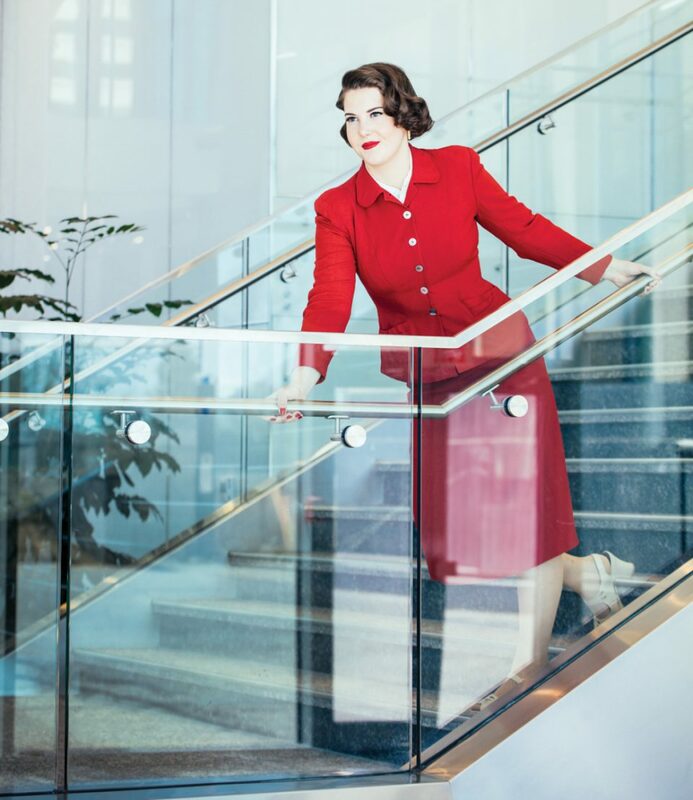 Callsen, now in Edmonton, rocks her distinctively old-timey appearance while working a different and very modern job. In the role of communications assistant in the Office of the Premier, she assists Rachel Notley with her social media accounts. But, despite her admiration for a decade long past, Callsen is not convinced the olden days had better ways. 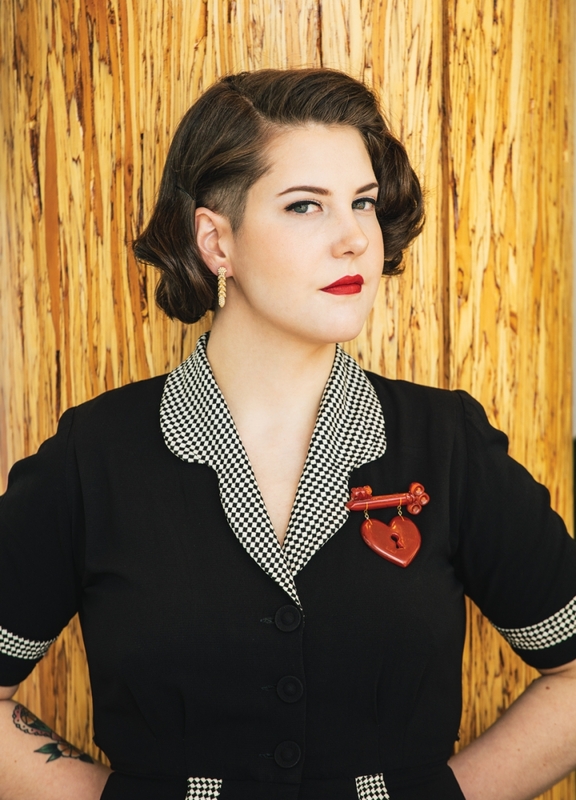 Mostly 1940s-inspired vintage, but in the last year to six months, I’ve been putting a harder edge on it, making it more 2016 and putting these different aspects of my personality into my style. Why are you inspired by the 1940s? As a young kid growing up, I was keenly interested in World War II, probably more than your average 10- or 11-year-old should be. Also, both sets of my grandparents were in their teens and early 20s during the 1940s, so that family influence interested me a lot. How did you adopt this style? The Camrose Canadian [where I worked] was across the street from a vintage store [Imagine Vintage]. I’d pop across the street and see what was there. I read other bloggers and watched old movies and listened to ’40s music, and just really got to know the era. One of the things I got pretty early on was a 1940s sewing manual, with beautiful illustrations and tips. That really helped when it came to cultivating my style, and then I also got into sewing and knitting my own clothes. Did others react to your change in style? I adopted it so gradually that I don’t feel like there was anyone in my life that said, “Whoa, you look completely different.” I do get a lot of comments from people on the street now, but they’re always pretty positive. It has been interesting because it has helped me forge different relationships, as not a lot of people dress like this. Through education. There has been a lot of learning and looking at other blogs and figuring out what I felt looked good and what didn’t. I started out doing more early ’50s and late ’40s with fuller skirts, and have transitioned into a structured ’40s style. I have a real love of the ’40s, as I feel it was a really interesting time for feminism and women’s rights and women starting to get into the workplace and starting to get more involved with society. What is your hair and makeup routine? in place. I usually sleep on it and take it out in the morning. I put pomade on it and brush it all out and, eventually, it forms into nice waves. It has only been the last two years I’ve perfected the hair. The makeup is really easy. I wear foundation, blush, black eyeliner without any wings, mascara, neutral eye shadow and red lipstick. Forties makeup was really quite low-key because of rationing. Do you wear vintage shoes? I don’t wear a lot of true vintage shoes as those are the things that are in the roughest shape. In the ’40s, you wore your shoes until you had holes in them, then fixed them, then fixed the patches. The majority of the shoes I wear are reproduction shoes, so brands that do a very 1940s take on a shoe. What other accessories complete your look? Brooches are one of my favourite, most fun accessories. I have brooches that are birds, dogs, a giant pink squirrel, a giant Christmas tree, sheaves of wheat. They’re bright pops of colour to add to your wardrobe. Another staple of 1940s and 1950s vintage accessories are Bakelite bracelets. They were made of a popular plastic and have a distinctive sound and smell. You know it is true Bakelite if you rub it and it gets hot and smells like formaldehyde. I have Bakelite bracelets in the NDP colours. I don’t go shopping very often, but if I do, I try to spend my money locally. I shop at Rowena for reproduction vintage styles, Swish and Divine/Decadence for vintage, and I also really like shopping at Goodwill. When it comes to online shopping, I stick to smaller, independent shops, even if the price point is higher. Is it challenging to dress this way? It’s a challenge, but in a good way. It was a lot of work at the beginning, but now it’s very habitual. And it’s not something I do all the time; on the weekends, I wear leggings and hoodies and have my hair up in a bun. I’ve had people say, “Oh, that’s not very 1940s of you,” but I also have half of my head shaved and a giant tattoo of lipstick on my arm. I’m not from the 1940s and I’m not beholden to that. The more boxes I put myself in, the more it feels like something I have to do, not something I want to do. For me, it’s fun to do. Can you describe your haircut and tattoo? It’s an undercut that goes all around, and you can’t tell when my hair is down, but you can tell when it’s up. The tattoo is of a tube of red lipstick surrounded by a heart and flowers, and it says “fierce” on it. It’s on my right forearm. My mom passed away six weeks after the [Alberta provincial] election, from cancer. She sold makeup and, as a teenager, part of my way to rebel was to not wear makeup. Eventually, I gave in and fell in love with red lipstick. Part of the thing that kept my mom going when she was going through treatment was trying to look her best. She taught me to look my best for myself, so if my best that day was my hair in a bun and maybe mascara, then good; if it’s full-to-the-nines red lipstick and pin curls, that’s good too. She was a very fierce lady.